Recently, I found myself quite nearly out of foundation. First, I had tossed all my old, really quite expired foundation (like MUFE HD. THEY DON'T EVEN MAKE THAT ANYMORE). Then, I started to run out of Dolce & Gabbana The Perfect Luminous Foundation (review here, one of my all time favorites). Next I ordered a bottle of Giorgio Armani Luminous Silk, a tried and true favorite, but encountered strange new oxidation with it, the likes of which I had never seen before. At the end of my rope, a sales associate at Sephora recommended NARS All Day Luminous Weightless Foundation. That's right. Me, purchasing a foundation without having read any reviews regarding it beforehand - I hope this conveys how desperate I was feeling. I'm kind of in between Deauville and Fiji. It's not ideal. With warmer, sunnier months approaching (and since my powder tends to leave a little bit of a pale cast), I just went for the darker shade. Since the store happened to be OOS of my shade, I ended up ordering a bottle there and the sales associate sent me home with a very generous amount to tide me over. The coverage is higher than I was expecting, given how very thin and very fluid the foundation is. 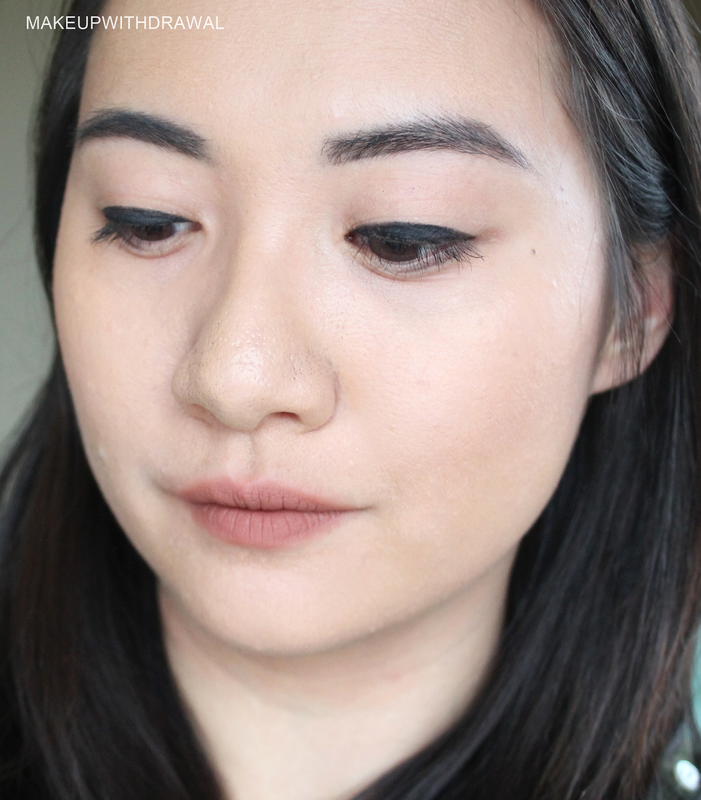 Usually I like my synthetic flat top brushes for stippling in foundation (like the Shiseido Perfect Foundation Brush, review here) but I looked a bit more lively when applying it with bouncing a blender sponge on my cheeks. I haven't really had any true flakey patches since I started a new cream (hint, post to come: a cream by Dr Jart+) but it did not flatter dehydrated areas and especially looked bad on my pores. 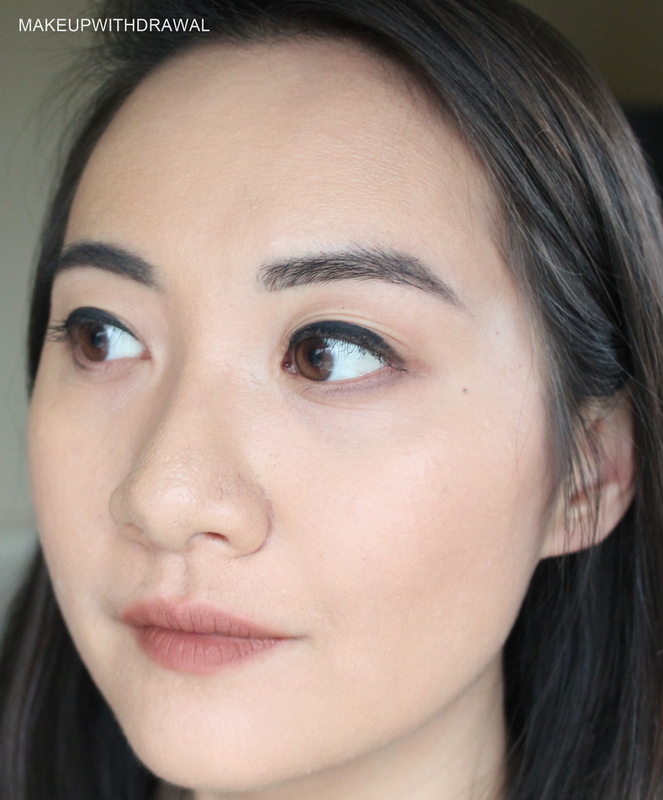 It made each opening look particularly deep and dark, drew one's eye to sebaceous filaments, even with my trusty Innisfree No Sebum Blur Primer (review here, as well as a good naked face picture for comparison) which is great at hiding that sort of thing. The finish is a bit of a chameleon. When I look at my face in the mirror after application, the look is rather satin, approaching matte territory. However when I look at photos where I've applied NARS All Day Luminous Weightless Foundation, I look decidedly luminous, glowy, what have you. I like that this foundation doesn't oxidize nor does it cake up, pill up, dehydrate throughout the day as I wear it. However it just does not feel as pleasant on my skin as other foundations. Whenever I have this liquid foundation on, I find myself very much looking forward to removing it. I count down the minutes until I can work an oil cleanser across my face to break down every little bit of this foundation. Completely opposite feeling compared to D&G The Perfect Luminous Foundation, where it's like putting on a second skin that feels more nurturing and comfortable than my original face. Without powder. Photographs quite nicely but I don't think it melts into skin and flatters large pores. Right, so the sample that I have? Every time that I open it there's been some separation and settling of the pigment. Though it is worth mentioning, I have no clue as the age of the in-store foundation bottle, from which my sample was made (NARS released this foundation early 2015, so max two years). I'm just not very taken with NARS All Day Luminous Weightless Foundation. 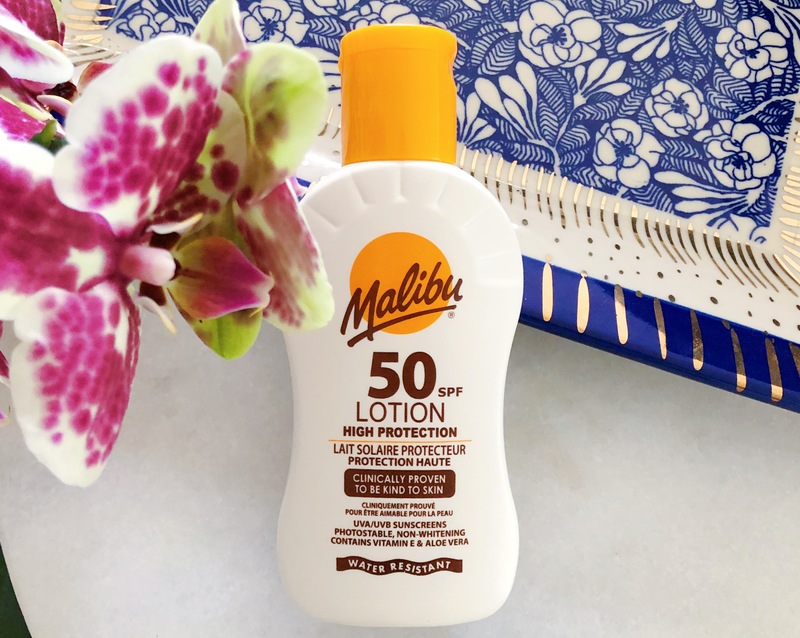 I don't always see the glow in person; on the on contrary I think that my skin looks quite lifeless and dull complexioned when I use this. Photographs tell a different story, but I would rather have a comfortable foundation that was always flattering instead of one that just looks good in pictures. Which makes me all the more glad that the sample I have saw 8+ applications and that I didn't crack open the bottle, because it is going back. 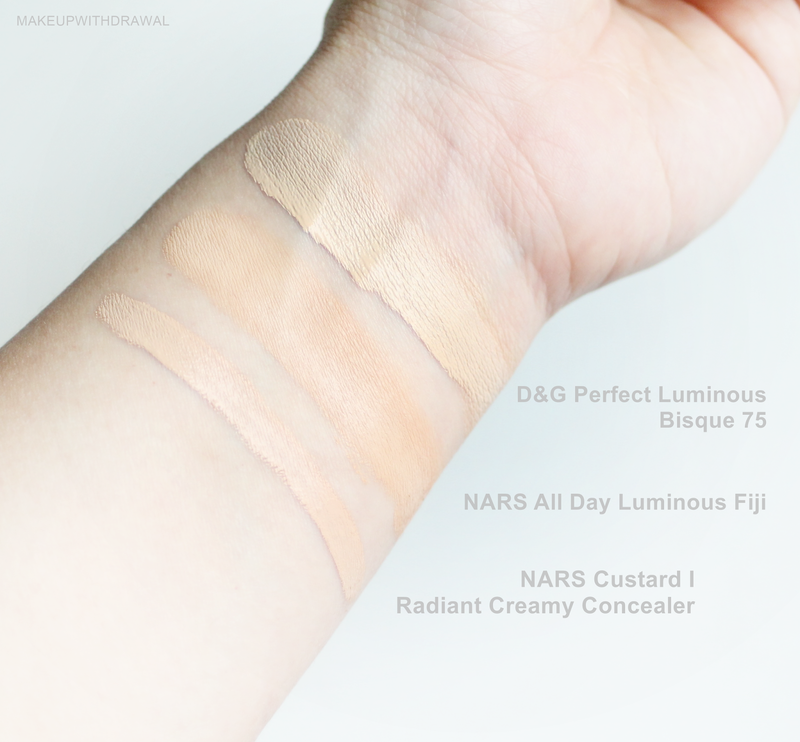 NARS All Day Luminous Weightless Foundation is $49 and can be purchased from the NARS website, from NARS counters at your favorite department store, and of course from ye oldeSephora. What's your current favorite foundation? And if you were in a foundation rut like me, what would you do? Repurchase the D&G foundation that I compare all others to, or keep letting that FOMO foundation mindset rule my next purchases?